It’s been aaaaaaaages since I’ve had another writer on here to discuss their work and their process – blame me and a year of just wanting to talk about myself. But I’m shrugging that off, I hope, and so it’s a good time to start getting a few other perspectives on things. And who better to start with than Jason Nahrung, whose profile has become bigger and brighter in the couple of years since I was introduced to him by one of several mutual friends. 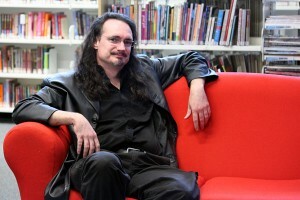 Jason and I both followed a similar arc of movement down the country, starting in rural Queensland, living in Brisbane (and hitting its goth clubs) and then drifting down to Melbourne to follow our writerly dreams – but then he kept going, moving recently to Ballarat along with his partner, award-winning author Kirstyn McDermott. There are other key differences between Jason and I, too – he works a lot harder than I do, his work focuses more on traditional Gothic themes, he’s really strongly engaged with the Australian genre writing and publishing scene, and he has much longer hair. So I thought it would cool to talk to him about these things. Well, other than the hair. Well, I DO have a regular job that pays better. That’s why I can afford to spend inordinate amounts of time transferring those stories reeling through my mind on to the page. The idea of making any kind of living from writing fiction seems unlikely; I don’t buy lottery tickets, either. Simply, I can’t help myself. The stories are there, they demand to be written. I think some of them are worth sharing. What’s more, I enjoy the art of seeing intangibles made real on the page, and the thought of them becoming intangible again – and something new – in the mind of a reader. It’s am amazing process! I can’t play music, I can’t draw, I’m no good at woodwork or anything like that. But since I was a young tyke, the words and I have got along passingly well. I give thanks to having had parents and teachers who’ve encouraged my reading, and by extension, writing – the two have gone hand-in-hand for me as long as I can remember. It took me a long time to consider my stories were worth the attempted selling, if not just the telling. It still feels a little precocious, to be honest. Every – any – sale comes as something of a surprise to me. A pleasant one. There’s a definite thrill in finding that someone likes your stories enough to pay to read them, or indeed, to publish them in the first place. That’s a kind of benchmark for me: is this yarn good enough that someone will pay me for it? But yeah, we’re not talking sheep stations here. A bottle of wine will do. When I think of your work, two recurring things leap out at me, and the first is the emphasis on the Gothic – both in the literary and the cultural sense. What draws you to that theme, and what keeps you coming back? That’s a question I keep coming back to as well! I love the Gothic mode – it’s probably a function of a love affair with Hammer Horror movies, the impact that Bram Stoker’s Dracula had on me as an adolescent, a social awkwardness that found its comfort zone in the smoke machines and atmospheric beats of Brisbane goth clubs. Discovering the gothic subculture and its music – especially the music, which is what I found first – as a country kid was eye opening. I think it was the romanticism, the otherworldliness … they appeal to me still. I feel I belong there, that it makes sense: outsiders, cynics, a certain fatalism. I love the variations within the subculture, the evolution of style as well as the more traditional fashions. I keep tapping that vein in my writing because it fits, I guess: my themes, my atmosphere. The other recurring element is this very strong sense of place, and local place at that. 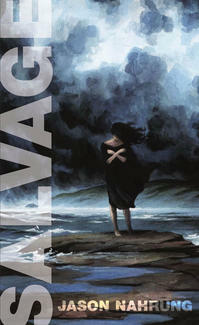 Salvage is a ghost story set on a Queensland island; Blood and Dust is a vampire story set in the Queensland outback. What is it about the Australian landscape (or even the Queensland landscape) that makes it so suitable for horror stories? It’s interesting you’ve pegged Salvage as a ghost story – to my mind, it’s more of an homage to Carmilla, although the heroine is definitely haunted by an event, rather than a spirit. It’s set on an island off the Queensland coast, an amalgamation of Bribie and Fraser islands customised to the needs of the story – primarily isolation. Isolation is the one thing Australia has plenty of – the tyranny of distance was coined for this country, not just in its distance from other countries and particularly the European motherlands of many of its early colonisers, but also within it: those tracts of land sparsely inhabited and in places barely habitable. For those not used to the bush, it’s a pretty alien place, and even for those who are used to it, it contains perils. It’s an unforgiving landscape made up of extremes: fire, flood, drought. The other thing Australia has going for it is a massive range of landscapes – beach, red heart, rainforest and alps; small towns, big cities – that can not only make for interesting backdrops but work as a sympathetic mirror for the characters’ emotional state, or contrast it. It’s nice at times to have some utterly bizarre event occur in the brightest, hottest sunshine, rather than in the middle of darkest night or at the height of a storm. I particularly enjoyed doing that in Salvage, where my vampire is trapped on a subtropical island, and my heroine is fighting off depression in what for most people is an idyllic seaside location – where people go to get away from their troubles. As well as your novels and novellas, you’ve written an awful lot of short stories. Last year you were part of the judging panel for the Aurealis Awards, specifically for the Best SF Short Fiction Award. What’s the SF/F/H short fiction landscape like in Australia at the moment, from both a reader’s and a writer’s perspective? I don’t think 20-odd is an awful lot compared to some, but thanks! I’ve been fortunate to have had exposure in recent years to a lot of quality writing due to judging the awards, in both collections and anthologies and the science fiction short stories category, and the one thing that really comes through is the way our writers are fearless genre blenders. It’s not unusual to see stories entered in more than one category, for instance: SF, fantasy, horror. In writing terms, we appear to have a flourishing local market for spec fic, with the likes of FableCroft and Ticonderoga putting out regular anthologies; mags such as Midnight Echo, SQ, Dimension6 and veteran Aurealis exploring the digital realm; plus some hungry new small presses such as IFWG and Cohesion making their mark. Then you’ve got Twelfth Planet Press’s Twelve Planets (now 13!) collection series, one of the most exciting projects around, actively encouraging some of our best women writers to produce work that, certainly in some instances, otherwise might have struggled to find a market, due to awkward subject matter or sheer length. At least digital, and to a lesser extent POD, publishing makes it easier to get longer shorts and novella-length work out there, at a time when 5,000 words, or fewer, seems to be becoming the most sought-after length. And thanks to the interwebs, overseas markets are more accessible now, too. You’ve worked with a number of independent Australian publishers, such as Twelfth Planet Press, Xoum and Clan Destine Press. What’s that experience been like for you? What are the positives, and are there any negatives? My relationship with Clan Destine is just starting – they’re bringing out my vampire duology Blood and Dust and The Big Smoke – but so far, it has felt very similar to my experience with the other two: flexibility, dialogue, professionalism, passion. When a small press picks you up, you know they’ve made a decision to expend reasonably sparse resources on you, so they’re not just throwing your work at the wall to see if it sticks – they’re convinced, they’re committed. The downside is, those limited resources, both financial and labour, usually present through difficulties in distribution to bricks-and-mortar shops, and in pursuing publicity, particularly in mainstream media where boutique, especially genre, publishers might have less traction. You grew up in country Queensland, lived in Brisbane and then in Melbourne, and now you’re living in Ballarat. Is it just wanderlust that keeps you moving? How has it been to go from a big city to a much smaller one? Surely it gets cold out there. I’d be frightened. Everyone who heard Kirstyn and I were moving to Ballarat told us how cold it was, but no one mentioned the wind! Luckily, Ballarat is a well-established town with suitable warm places for artists to gather –we’ve just got to get around to meeting some to gather with! But to answer the question, I’ve moved originally as job opportunities presented themselves, moving to increasingly large population centres until I hit Brisbane. Then I met Kirstyn, who was in Melbourne, and so I moved to the chilly south. We headed west last year because house prices were way out of our reach in Melbourne, and Ballarat is close enough that I can still pop in for work, or an event, without it being too onerous a commute. I’ve got Blood and Dust and The Big Smoke with Clan Destine now heading toward publication, and an old outback occult yarn still waiting to be knocked into shape. I’ve also got a few short stories on the go, primarily what promises to be a suite of yarns set in Brisbane around the year 2100, when the risen sea has surged past the dykes and wreaked some watery havoc – the first, ‘Watermarks’, was recently published in Cosmos, and I’m exceedingly chuffed about that. You can find out more about Jason’s work, stories and books at his website; you can also follow him on Twitter at @JNahrung.